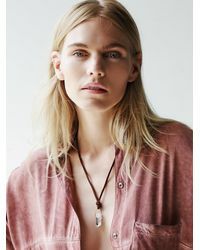 See more Free People Necklaces. We check over 450 stores daily and we last saw this product for £40 at Free People. Handmade in Denver, this leather cord necklace features a frosted quartz crystal pendant and hand-stamped silver plate with the words “love” or “Namaste. 14k gold wire fill runs through crystal. CLP. Measurements: Length: 42 in = 106 3/4 cm.